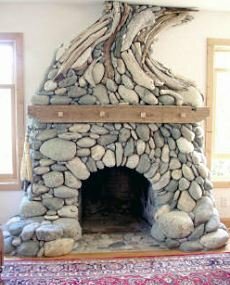 Stone Fireplace Picture Gallery...Unique Designs To Rock Your World! 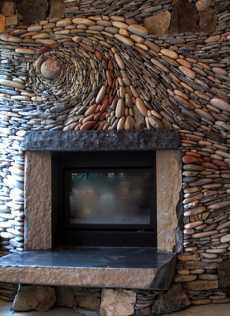 The images in our stone fireplace picture gallery are designed to rock your world (well, almost)! 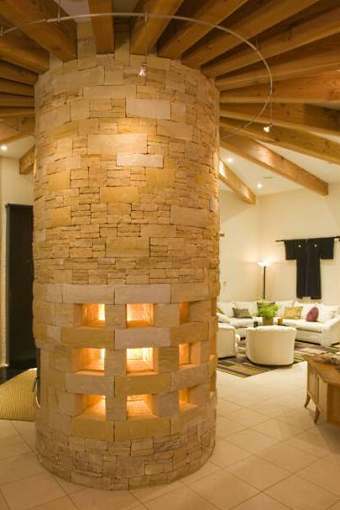 Featuring some of the most unique stone fireplaces we've discovered to date, they defy the laws of conventional design. Chiseled, carved and stacked in unusual patterns, shapes and forms, they are crafted from a wide and varied assortment of stone types ranging from sandstone to soapstone! Traditional or contemporary, for indoors or out, the fireplaces pictured here did not "escape" the artistic vision of their creators to exceed the limits of conventional design. To penetrate the usual boundaries and go beyond what is considered "the norm." Clearly, a considerable amount of time, effort and ingenuity went into making these notable, one of a kind examples of the stone artisan's craft. We applaud the talent and unbridled creativity of these individuals for enriching our lives with their unique creations! 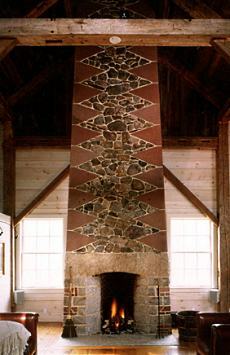 Pictured below is a large cut stone fireplace surround from Freshwater Stone, based in Orland, Maine. 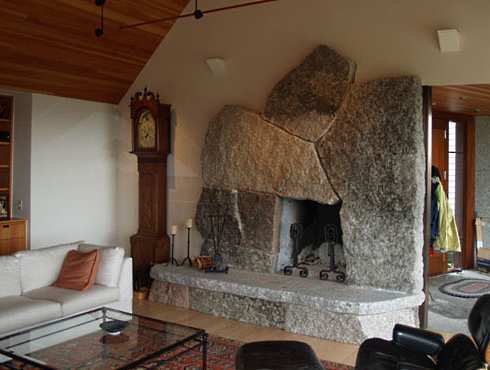 Massive slabs of granite frame a soapstone firebox in this striking design. 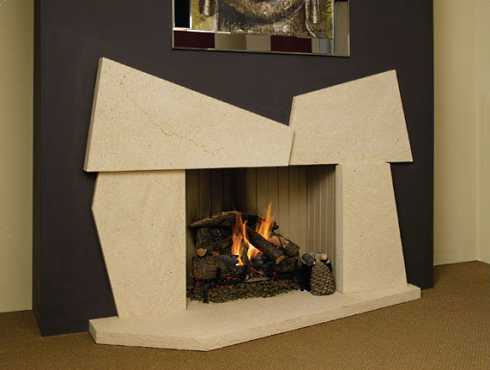 The aptly named "Flintstone Fireplace" pictured below is from British manufacturer, FireCraft. Available in both sandstone and cream-colored argel stone, it features a ribbed effect stone interior. The monumental floor-to-ceiling fireplaces that follow provide a dramatic focal point to the respective rooms they anchor! Though both are beautifully designed and executed, they differ dramatically in terms of styling, construction, and use of materials. Pictured below, left, is a striking Rumford firebox framed with blocks of cut granite. Painstakingly handcrafted by Monterey Masonry of Sheffield, Massachusetts, the design features an ascending geometric pattern of fieldstone panels set within a brownstone surround or "overmantel." Contrasting stone types, textures and colors make this a real stunner! Vastly different -- but no less stunning -- is the stone fireplace pictured below, right. Created by True Stone Enterprises, based in Deming, Washington, the surround is made of columnar basalt, a type of volcanic rock. Vertically oriented, the stones are carefully positioned to evoke their natural geologic formations. Incorporated in the design is a prefabricated metal firebox on a raised hearth. Gracing a beautiful east coast home designed by renowned architect Robert A. M. Stern is a circular library, part of which can be seen in the photo at left. 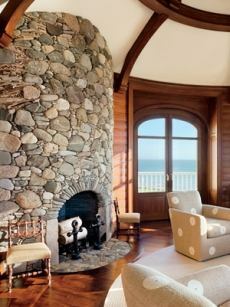 Wood-lined walls and a beamed ceiling provide a striking backdrop for its soaring stone fireplace. Meticulously crafted by master stone artisan, Lew French, the fireplace surround echos the room's gentle curve. An arched firebox opening takes its design cue from paired French doors that open to a sunny seaside deck! 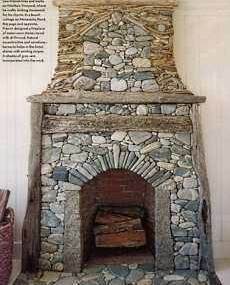 The creative, finely executed fireplace designs that follow incorporate water-worn stones and weathered driftwood in their surrounds. Pictured below, left, is another design by Lew French. Masterfully crafted, it adorns a beach cottage on Martha's Vineyard. Hopping across America to the west coast brings us to yet another master stone artisan . . . . . Michael Eckerman of Santa Cruz, California-based Eckerman Studios. A modern day "Renaissance Man," Michael is immensely talented in a variety of artistic disciplines -- not the least of which is stone masonry -- as evidenced by the striking stone fireplace pictured below, right. Created for a client in Victoria, British Columbia, its design evokes the formation of a rolling surface wave as it rises. Continuing the artistically arranged, organically-inspired theme is one of Andreas Kunert's elaborate stone fireplace designs, pictured at right. Principal of Ancient Art of Stone in Victoria, British Columbia, Andreas' unique and distinctive work features an intricate spiral pattern formed by varying size stones in a rainbow of contrasting colors. Heading south to California, once again, brings us to the Sierra Nevada Mountains, home of Pierson Masonry. 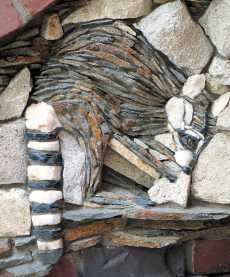 Principal Robert Pierson is another highly skilled stone artisan with his own uniquely distinctive style. 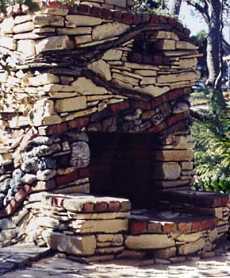 His work often combines bricks with stones, such as that shown in the organically arranged outdoor fireplace surround with raised hearth pictured below, left. Inspired by the flora and fauna around him, Robert's work often features very intricate and finely detailed stone mosaic murals (below right). 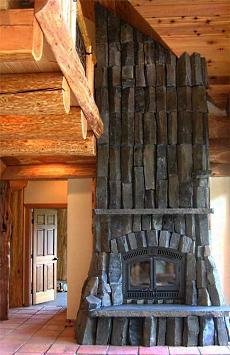 Please check back often or subscribe to our RSS feed, as we fre- quently add new stone fireplace pictures to our site. Subscribe to our Monthly e-Newsletter for More Exciting Fireplace Design Ideas!